Ancient Romans used a number system that is very different from ours. Learn to write numbers as the Romans did thousands of years ago. 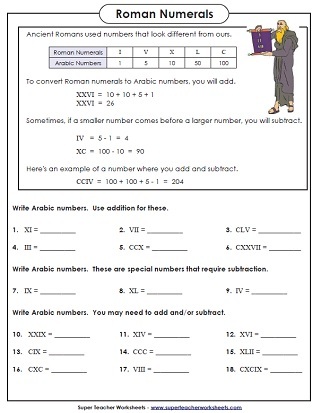 These worksheets include basic and advanced level Roman numeral activities. Match the Roman Numerals in the mystery picture with the Arabic Numerals in the key. Color the picture to reveal an airplane. When students match the roman numerals on the picture and color according to the key at the bottom, students will reveal a picture of a large whale. Connect the dots to make a picture of a fish. Roman numerals 1 through 10 (I through X). Write the Roman numerals in standard form. Also write the standard numbers as Roman numerals. Intermediate level includes symbols I - C, or 1 - 100. 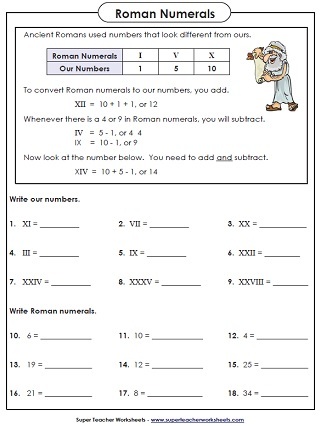 This worksheet has students ordering Roman numerals, and comparing their values. There are also two short word problems. 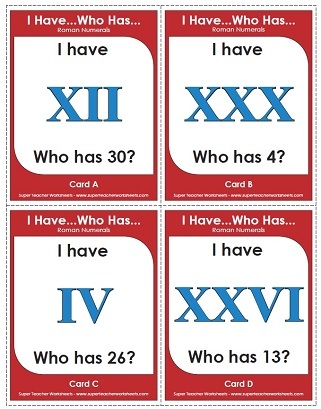 Students will love playing this whole-class card game to review Roman numerals I - C. Includes 30 game cards, instructions, and an answer key. Cut out the Roman numeral squares and glue each one next to the corresponding Arabic numeral. Count up to 100 in Roman numerals. Complete the missing numbers on the table. Math the Roman numerals in the picture with the Arabic numerals at the bottom of the page. Then color according to the key. This ladybug picture has numbers up to 22. This advanced level practice page includes Roman numerals with symbols I - M, or 1 - 1,000. Students write the Roman numerals in Arabic form, and vice-versa. Also includes three word problems. What do ghosts do before they drive away in their cars? To find the answer to this cute riddle, students must convert roman numerals into standard numbers. These worksheets include ordering numbers, place value charts, expanded form, underlined digit activities, and more. This page will take you to our full index of math worksheets.